Order tickets on line until 2 hours before departure time. Any unsold tickets will be available on the day of the excursion at the Whippany ticket office on a first come, first served basis. Credit cards are not accepted at the ticket office. 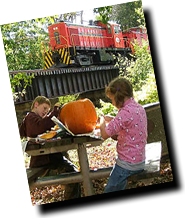 Ticket price includes admission to the Museum grounds and Museum building which houses historical railroad and steam ship memorabilia displays as well as operating model trains, gift shop and the outdoor operating large scale model trains. Please consider making a donation to the Whippany Railway Museum. which is why we look to our friends to help support our preservation efforts. A donation to the Restoration Fund will be directed toward a currently-in-progress equipment restoration project. The Museum's historic steam locomotive, US Army #4039, is undergoing restoration. A contribution to this fund will help the Museum achieve its goal of returning it to operating service. The bolt referred to is a stay bolt, which is used to keep parts of the boiler in place. The Museum's historic steam locomotive, US Army #4039, is undergoing restoration. A contribution to this fund will help the Museum achieve its goal of returning it to operating service. The bolt referred to is a stay bolt, which are used to keep parts of the boiler in place. Donations to the DL&W 2454 Club Car will help the Museum return to service this historic subscription car. Built in 1912, it spent much of its service time operating between Gladstone, NJ, and Hoboken. Help restore our historic 1923 Pennsylvania RR cabin car (The Pennsy's term for caboose). A rare surviving example of a class N5b type car, it was also used by the Morris County Central in the 1960s. 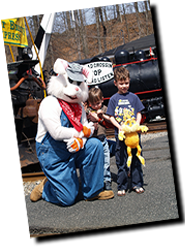 The Whippany Railway Museum is a 501c (3) non-profit organization. I understand this donation is tax-deductible to the extent of the law. 12 Noon until 4 PM. The Whippany Railway Museum has been bringing to life the history of New Jersey's railroads to the public since 1985. Offering family entertainment for young and old alike. Weekly excursions and events are a thrill for the whole family. Tickets can be purchased here for all our excursion events. Due to popularity of our events it is recommended that you purchase as well in advance as possible. 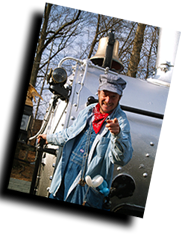 Our Excursion Train Rides are part of a fundraising effort to benefit the Whippany Railway Museum, a 501 (c) 3, non-profit Operating Heritage Railroad comprised of New Jersey-related rail and transportation artifacts that is staffed by Volunteers. Donations from the public help to keep the Museum operational, but funds are still required to support this unique New Jersey treasure. Proceeds from the train rides will further enhance the Museum's mission and its Historic Preservation efforts.